Sara Pags : Micellar Water: Which To Choose? There is a thing I discovered this year after a long time of harsh makeup removers use. I'm talking micellar water. This product takes a lot less time and effort, making my skin very clean without any irritation. By now, every brand is putting one of these on the market, so you may feel a little overwhelmed by the variety available when it comes to pick which one to purchase. Although I'm not very keen on skincare, micellar water is one of my essentials and I could definitely say that I've tried quite a few so I can guide you through this difficult choice. Here is a little review of the most popular ones and my opinion about the best one. This is a cheap one, removes my makeup very gently and doesn't irritate my skin. However, if only a drop of it ends in my eye when removing mascara, it begins to burn and my eye goes all red. For this reason, I can't really say it's worth buying, since eye makeup is not just an irrelevant part of the whole thing. This one is pretty much the same as the previous one, if not worse. Whenever I use it I have to make sure it is away from my eyes, plus it is a bit less effective than the l'Oréal one in the cleansing my skin deeply. 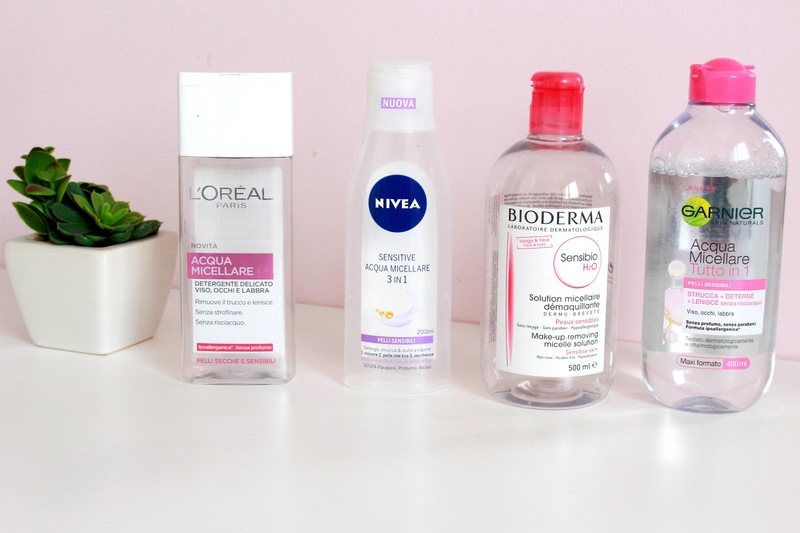 When talking all things micellar water you can't mention Bioderma, which is probably the most famous brand for this product if not the first to sell it. And I can definitely see why it is that highly raved. It removes makeup perfectly and my eyes are totally okay with that, which is a big thing. The only little flaw for me is the price: it's at least double the cost of the others, and considering the fact that I buy a bottle at least once a month, I think it's pretty expensive. As I see it, Garnier this time has smashed it. Their product is the most similar to the Bioderma one, but for half its price. I am totally addicted to this micellar water right now since I don't have to pay attention to how much of it I use or where I apply it. My skin loves it and I can't live without it. These were my final opinions about a few of the types of micellar water I tried, I hope you found them useful. Have you used any of these? If yes, which one is your favourite? Let me know in the comments below - I'd love to hear your points of view! I love them too! I like Bioderma but try the Garnier one, you might like it as well!